Before there was ever 200 Degrees, the award-winning coffee shop in the centre of Nottingham, there was 200 Degrees Coffee Roasters, who first brought my attention to Nottingham as somewhere where you could get decent coffee. 200 Degrees grew out of Belle and Jerome, a well-known coffee shop in West Bridgford, just down from Trent Bridge cricket ground, and a desire of the owners, Rob and Tom, to roast their own coffee. The catalyst was third partner, Tim, who brought a passion for roasting, having caught the coffee-bug in New Zealand. Called 200 Degrees after the temperature green beans are roasted at, 200 Degrees grew from fairly humble beginnings to become what is now a fairly major player in Nottingham’s growing speciality coffee scene. As well as supplying its own coffee shop, 200 Degrees also supplies a number of other local shops, roasting a couple of espresso blends, a filter blend and three or four single-origin filters. 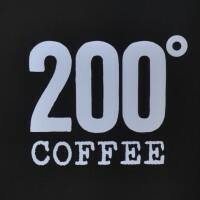 As well as supplying coffee, plus the necessary kit to go with it, 200 Degrees is also expanding into training, both for its wholesale customers and for the general consumer, as seen in its training room at the 200 Degrees Coffee Shop. I visited Nottingham this summer for what was ultimately a futile attempt to see England take on Australia on the 4th day of the Ashes Test (futile because the game ended on the third day, thanks to Stuart Broad’s return of 8-15 on the first day). However, my trip was not wasted because the following day I visited Tim, who I’d met at the Coffee Stops Awards, at 200 Degrees’ roastery, a big warehouse-type building by the River Trent, in the shadow of Meadow Lane, Notts County’s ground. Tim started his journey into speciality coffee after university, when he worked in bars and a major coffee chains. Having got a passion for coffee, he went to Auckland, New Zealand in 2009, managing Café Bliss, on Ponsonby Road, using Allpress coffee. That might have been that, but then Greg of Café Aroma, a coffee roaster from down the road, came in. It was Greg who got hooked Tim on roasting, first at his home in New Zealand and then, when he returned to the UK, in a popcorn roaster. On his return in 2010, Tim worked at Copper, another West Bridgford institution, where there was a strong coffee-focus. However, he started managing a pub, Tim got chatting to Rob and Tom, owners of nearby Bell and Jerome. Rob and Tom, in Tim’s words, were already interested in good quality food and wine, and this naturally extended to coffee, where the intention had always been to roast their own. However, they didn’t know that much about it, until Tim came along. The rest, as they say, is history, with 200 Degrees being formed as a joint-venture between the three of them. At first it was a steep learning curve, Tim graduating from popcorn roaster to 15 kg Toper, spending over a year developing roasts/blends, which eventually turned into 200 Degrees house-blend, Brazilian Love Affair. This, unusually for the speciality coffee industry, contains a Robusta component, Tim explaining that they wanted something that cut through milk and wasn’t too far from what the general public were already used to. All this experimenting introduced them to the speciality side of coffee and, at the start of 2014, they were joined by Mike, originally from Small Batch in Brighton, now 200 Degrees’ head roaster. Mike’s passion is single-origin filters, bringing another dimension to the output. As well as Brazilian Love Affair, 200 Degrees now roasts another espresso blend, changing every month or so, a Brazilian/Guatemalan filter blend and a single-origin Colombian Augstino. This is joined by two or three other single-origins, all roasted for filter. These are bought by the sack, so they change fairly quickly. The plan was always for a roaster/coffee shop (although the two are separate, but closely-link businesses). However, the roasting side came on-stream first, while the team held on for the right spot for the coffee shop, snapping up the Old Flying Horse (the location of the 200 Degrees Coffee Shop) when it became available. It’s still early days for 200 Degrees. There are plans for a second coffee shop at Nottingham station, plus selling direct to the public through subscription services, as well as to expand the training side of the business. On the roasting side, 200 Degrees is looking to continue to move into the speciality coffee field. You can also see what I made of all the 200 Degrees branches that I’ve visited. This entry was posted in 200 Degrees, Meet The Roaster, Nottingham, Roastery by Brian Williams. Bookmark the permalink.